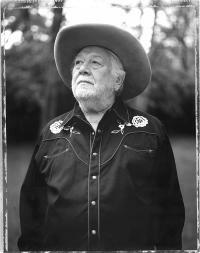 Any rational discussion of Cowboy Jack – and the events leading up to this, his first album in over 25 years and only his second as a solo artist – must start with the requisite reading of one highly abridged history: Born in Memphis in 1931, by his twenties had formed bluegrass and Hawaiian bands, recorded rockabilly pioneer Billy Lee Riley, and shared stages with a teenaged Elvis. Hired by Sam Phillips in 1956 as right-hand man at Sun Records, where he produced groundbreaking rock & roll tracks by Charlie Rich, Roy Orbison, Jerry Lee Lewis – including Whole Lotta Shakin’ Goin’ On – and Johnny Cash. Moved to Nashville in 1959 as Chet Atkins’ assistant at RCA and soon became one of the first independent producers to work for a major label. In 1965, he broke country’s color barrier when he discovered Charley Pride and went on to produce Pride’s first 20 albums and biggest hits. Along the way, Clement would also produce landmark records by Cash, Sheb Wooley, John Hartford, Doc Watson, Townes Van Zandt, Don Williams, Waylon Jennings, Louis Armstrong and polka king Frankie Yankovic. In 1988, U2 asked him to produce tracks for their RATTLE AND HUM album. Jack had never heard of the band but enjoyed the sessions nonetheless. A member of the Nashville Songwriters Hall Of Fame, his songs have been recorded by Hank Snow, John Prine, Cliff Richard, Ray Charles, Gram Parsons, Tom Jones, George Jones, Porter & Dolly, Gerry & The Pacemakers, Garth Brooks, Johnny Cash, Charley Pride, Jim Reeves and Foghat. He formed publishing companies, launched his own label, built his own studios, produced a cult horror film, has mentored many of Nashville’s top writers and producers, and is currently ‘Executive Tour Guide and Scenic Consultant’ for The Country Music Hall Of Fame And Museum. The album’s songs themselves are a combination of past Clement classics, new – and new-old – Jack tunes, and songs he loves by friends he’s known. And as Jack promises, every song has its own story to tell. “I’ve been singing No Expectations for years,” Jack says of the Jagger/Richards opener. “In fact, I first sang it to Johnny Cash who went and recorded it. But I didn’t hear the Rolling Stones version until recently. With It’ll Be Me, I’ve been trying to sing it ever since Jerry Lee Lewis cut it in 1957. He wouldn’t do it the way I wanted him to. Every Place I’ve Ever Been was co-written by me and Zell Miller, who at the time was Governor of Georgia.“ Dreaming My Dreams first appeared as the title track of the 1975 Waylon Jennings album co-produced by Jennings and Jack that remains the defining project of the Outlaw Movement. “My relationship with Waylon started before he ever came to Nashville,” remembers Clement. “Bobby Bare was playing a tape of him around town, and I really liked it. Waylon showed up six months later, and I first met him at a Johnny Cash session. He thought I was lookin’ at him funny.’ He went over to Johnny and said, ‘If that guy looks at me that way again, I’m gonna hit him.’ We did have our fights over the years, but to me he was always King Of The Cowboys.” As for Drinking Carrot Juice, Jack describes it as “a love song about carrots” and will gladly explain how it precipitated the second divorce from his first wife. Ultimately, what shines through every track of GUESS THINGS HAPPEN THAT WAY is the sound of a 73-year-old legend still full of surprises, doing what he enjoys most and does best. “What else am I gonna do?” Jack asks. “I’ve been a music bum all of my adult life. Making music has always been my hobby and it still is. I’ve always said that we’re all in the fun business, and if we’re not having fun then we’re not doing our job.” Once again – and like never before – Jack Clement has done the job like nobody else. But is there a moral to this musical story, a final message left dancing in the air of The Cowboy Jack Ear Show? 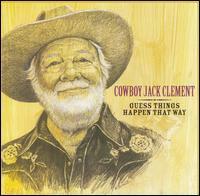 I dagarna släpptes äntligen Cowboy Jack Clements andra album »Guess Things Happen That Way« , nyligen recenserat av Christer Olsson här på Rootsy. Det var anledning nog ör Lennart Persson att ringa upp sin hjälte. Som bad om ursäkt för att det dröjt så länge. »Andra saker kom emellan«.